Powers: Equinox has the ability in a state of thermodynamic flux to generate both intense heat and cold simultaneously. Whenever he activates his powers waves of both fire and ice coruscate across his skin, these shifts increase his strength to superhuman levels and also allow him to generate flame and ice constructs. Terry was the child of two gifted scientists. His father even had a radical theory on thermodynamics that lead to estrangement and loss of work. As a result he began drinking and abusing his wife. Terry and his mother eventually moved out when he was seventeen but as they departed a fire broke out and Terry rushed to his father aid. In the process his father was killed and he was mutated into a creature in constant thermodynamic flux. His mother spent the next few years attempting to cure him and he began stealing whenever money ran short. 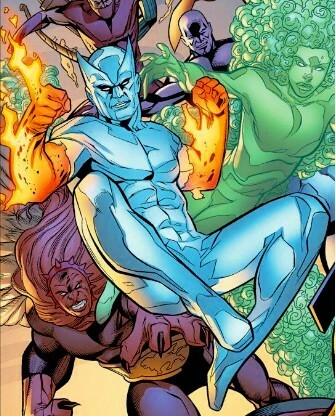 As a criminal he fought Spider-man, Iceman and the Human Torch. The unstable natures of his powers lead to bouts of insanity which were eventually stopped when his mother teamed with Spider-man and others to negate his powers. Equinox then joined Vil-Anon where he learned to control his powers and gave up a life of crime. He started a family but his wife later died. As a single father he learnt his daughter Janet had inherited his powers and caused a series of fires. He attempted o teach her control but to no avail. The Falcon intervened and managed to defeat him and direct him and his daughter to people who could help her control her powers. During Civil war he opposed registration and landed in the negative zone prison. After the event he joined the Avengers Initiative as a member of “Freedom Force” Montana’s team. Around this time he was abducted by the Skrulls but rescued after Secret Invasion.